A line of thought recently kicking round my head has been the characterisation of disciplines according to the manner in which they express experience of reality – dance through movement, philosophy rational argument, music sound and so on and such. As a strict categorisation the notion is overtly simple (I would suggest as any strict categorisation of anything is bound to be), in practice any instance of these fields is likely to fit no neat box – so be it. The focus of my thinking is not on categories, but rather discourse between disciplines. How do voices in different forms enter truly reciprocal discourse? What is it for these different expressions to engage in one conversation? Which brings me to Ptarmigan. Independent art practice Ptarmigan was transposed by John Fail (American, self-confessed semi-pro John Fail) and Lewis McGuffie (British, Graphic Designer) in 2010 from across the Baltic Sea, Helsinki. In its Estonian form it resides tucked, atop the city wall, sharing space with Tallinn’s Canadian embassy. It is a pleasingly sophisticated locale, with the houses of parliament and the orthodox cathedral amongst the dignified neighbours, but an unlikely one for a hive of creativity. The paradox could not fit the pair better. 2 years in, Ptarmigan’s programme has covered not only the traditional art workshops and music performances, but a whole smorgasbord of less likely activities: Saturday sports creation, cup-cake nights, battery restoration, sleep-overs, tattooing and most recently a fly-by-night workshop in ‘benign explosions’ (more on this soon). It is a programme aimed equally at Estonia’s cultural confusion as its improvement, a list that could well define eclectic. And one that, even after several encounters with the minds behind it, had left me grasping to pinpoint the practice’s raison-d’etre. Perhaps in talk of discourse, though, is the clue. We may, as at the outset, talk of practice in the individual sense, an artist’s practice, a photographer’s practice, but this is to miss the point – to overlook that expression is an outward act, conversation between subjects, and practice of any form social practice. And if all expression is social then Ptarmigan is a meta-practice – a practice whose practice is practice – one several steps further into the social than the generalisation requires. That an organisation not only be susceptible to sociality and conversation, but find the core of its own form and expression around those norms, is a concept that could hardly be more relevant in Tallinn. An often times head-on (at least cultural, if not so often literal) collision of lingering occupation-resentment and concrete ethnic division, rampant, young individualist hegemony and a small car load of Balto-Nordic social reticence – it is a society sorely in need of avenues of rapport. What would be a mistake, however, would be to reduce Ptarmigan’s purpose in sociality to an art therapy en-masse. A renewed emphasis in the last 6 months has seen the practice turn more explicitly toward alternative education – but still under no apparent utilitarian value code. No goal in sight or mind. Nor is this education aimed at any breed of student. 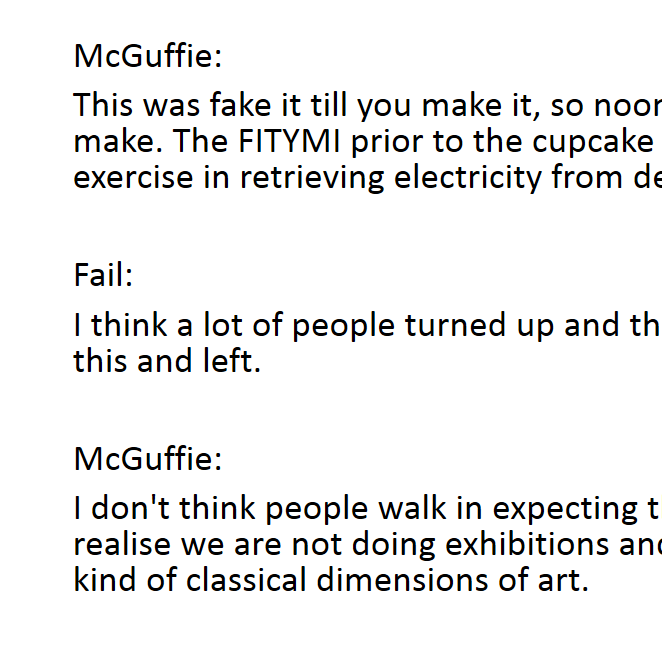 The programme for confusion not improvement that remains the project’s character is no accident, result of lack of focus, rather it’s a quality that Fail and McGuffie vocally embrace. Dreaming of drowning the premises for an underwater event, it is the strangeness, the nebulous incoherency of mission that makes Ptarmigan more than just arty stage for social get togethers. A practice of its own.